The Brazilian BBQ McSpicy was the first Rio Olympics burger to appear in South East Asia, and my second to review after the New York Onion Shrimp Burger from Korea. 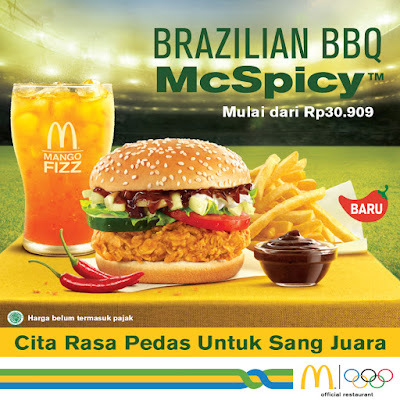 The McSpicy, is a regular menu item in Indonesia, Singapore and Malaysia and is a fried dark meat (chicken thigh) patty which is the chicken itself is seasoned with a bit of chilli. 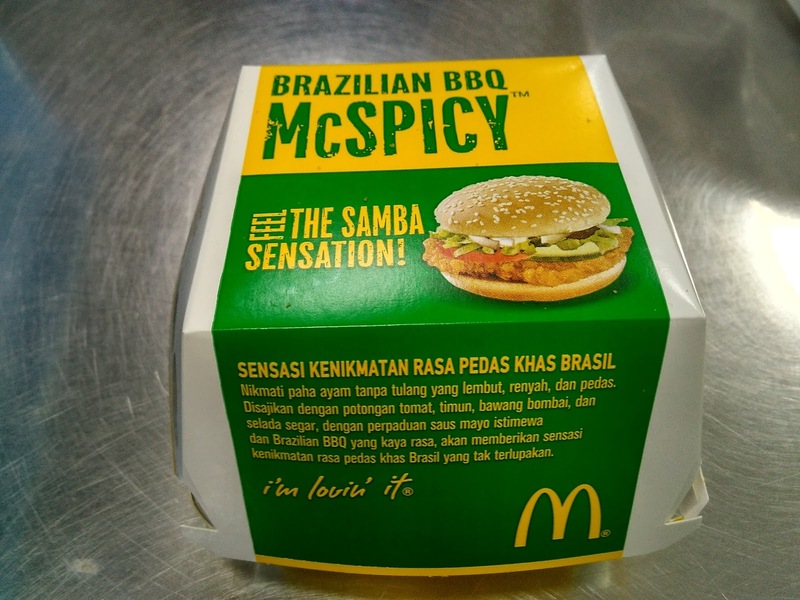 It might be sold under a different name, but essentially the same patty with or without the added spice is sold in pretty much every country in Asia. 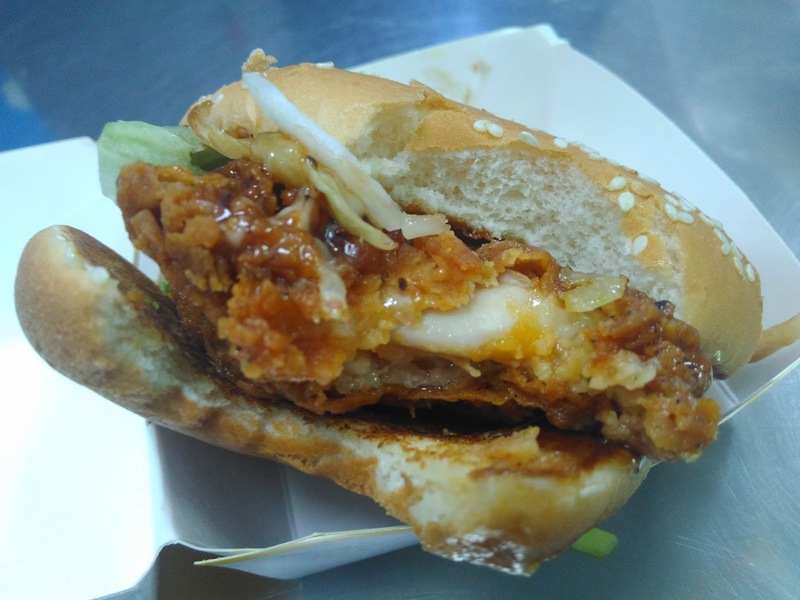 Many readers from South East Asia have asked if I can "handle" a McSpicy, and I've never found it actually spicy, but this piece from Indonesia was certainly hotter than the ones I've had in other countries, but I still wouldn't call it spicy. 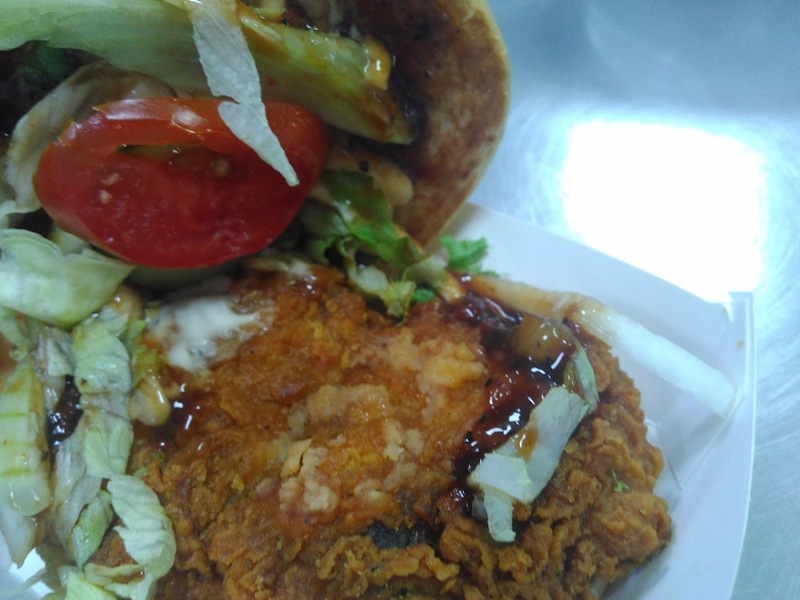 A nice change was that the patty had a significant amount of meat hidden under the breading, and although it was oily, it wasn't offputtingly so, nor was it full of chicken skin. It was one of the few times in recent memory that I finished and enjoyed the entire patty of fried chicken. The standard McSpicy is served only with lettuce and mayo, so really all you can taste is the meat patty. This Olympic tie-in kept the same lettuce and mayo, but also included slices of onion, tomato, a "Spicy Brazilian BBQ Sauce" and strangely enough, cucumber. 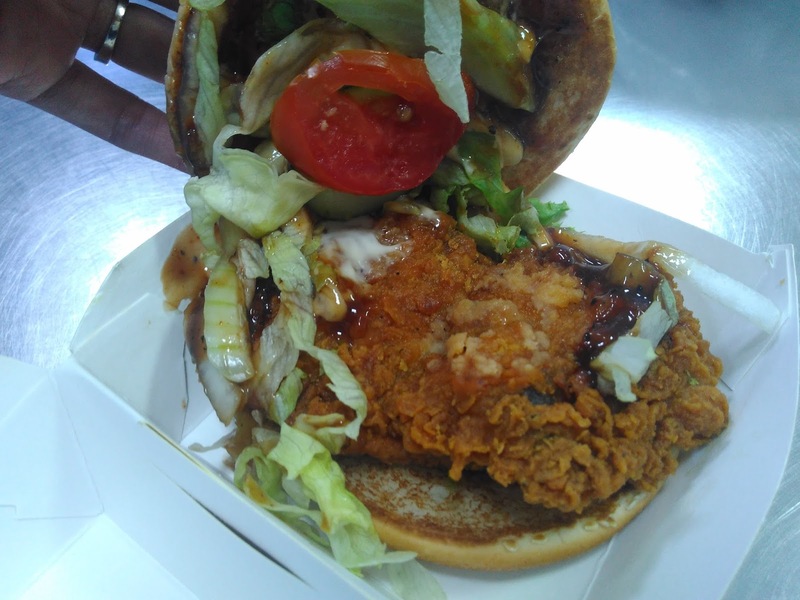 I'm not totally sure if it's just my luck to hit two back-to-back promos in Indonesia that used cucumber since the last burger I reviewed, the Balado Burger in August 2015 also included this "special topping". 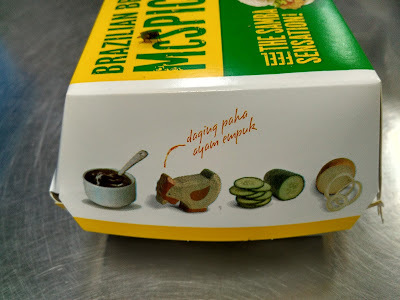 Whereas I praised the 3 large slices of cucumber in that review, there was only a single small piece hidden under the tomato this time, but the odd-sounding combination of cucumber + BBQ sauce actually worked pretty well and with a couple more slices it would have been great. The Wife found that Zombie Clown Ronald McDonald T-shirt. 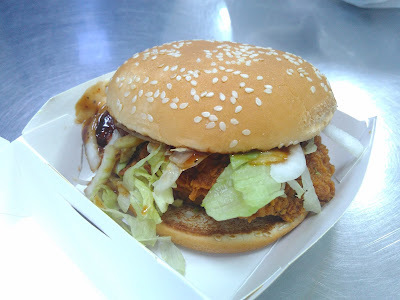 I'll say it before, and I'll say it again, having 2 sauces on the burger didn't help it at all, and I would have preferred the Spicy BBQ sauce on it's own, as the burger didn't need mayo, and it didn't add anything to the flavour. 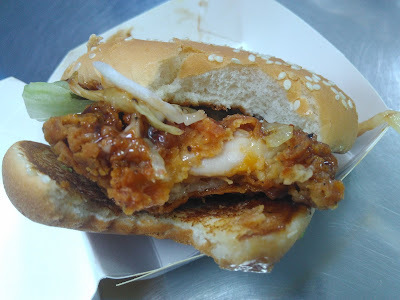 That BBQ sauce however was one of the better attempts I've had in Asia, as it was actually more smokey than it was sweet, and it was a pretty good combination with both the cucumber, and the spicy-on-its-own chicken patty. A few other points of note came out of this review. When I placed the order for this burger, The Wife saw a poster for the Fish Bites and wanted to give them a try. I told her they were some of the worst items I've ever had, but strangely enough she still insisted (that must have been some poster). 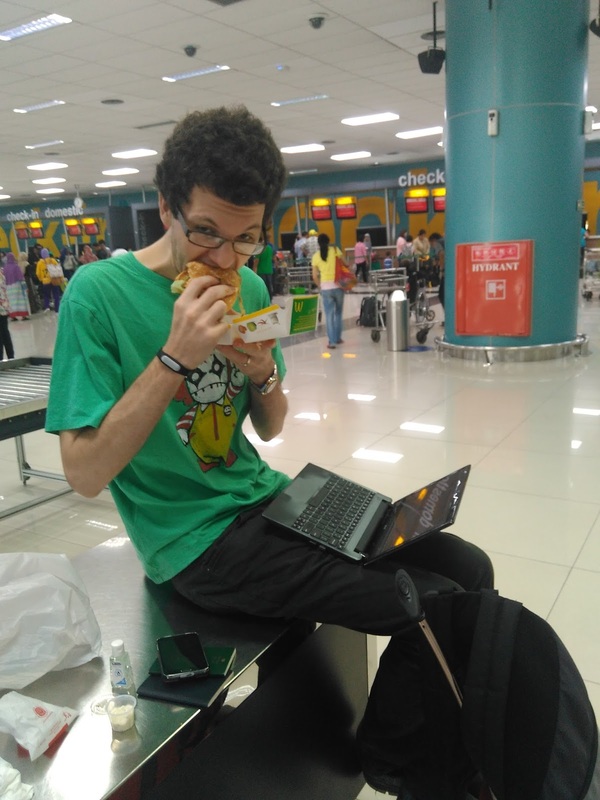 As we were at the branch right when the clock struck 11am when they switched from breakfast to lunch, it was easy to see they (as well as my burger) were cooked to order. 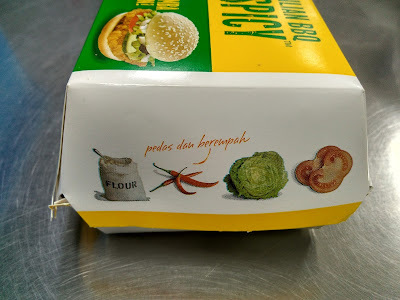 Unlike the ones I had through McDelivery, these were soft, hot and very tasty. Rather than tasteless hard balls of something, these actually tasted like fish nuggets. 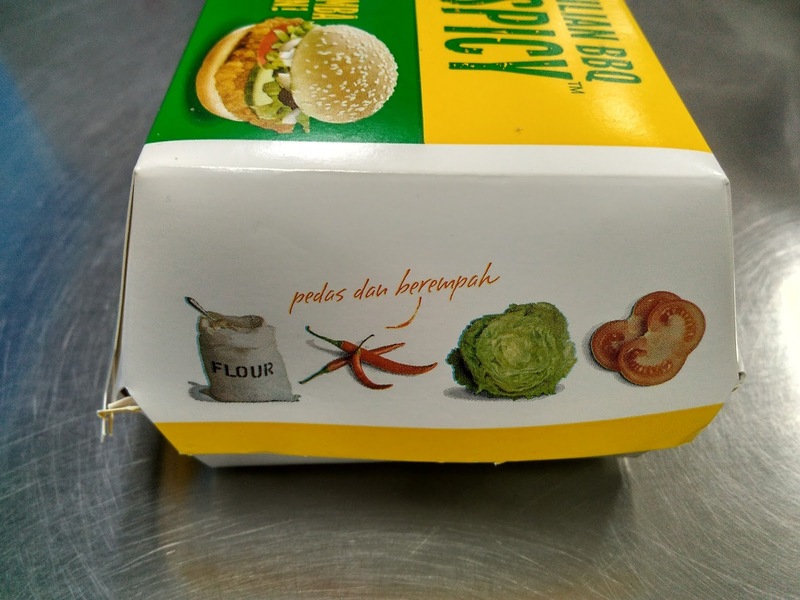 I still stand by my original review, but if I could have reviewed these fresh, they probably would have been a 4/5, which just goes to show how bad McDelivery can be, (even if the prospect of delivered McDonald's sounds like a good idea to those of you that don't have it offered where you live). Together with the Fish Bites I also tried to order the Onion Dip again, and surprise surprise I'm now 2/2 for getting tartar sauce instead of Onion Dip...even when I double checked with the person taking my order. Please come to Malaysia to try our Ramadan menu! 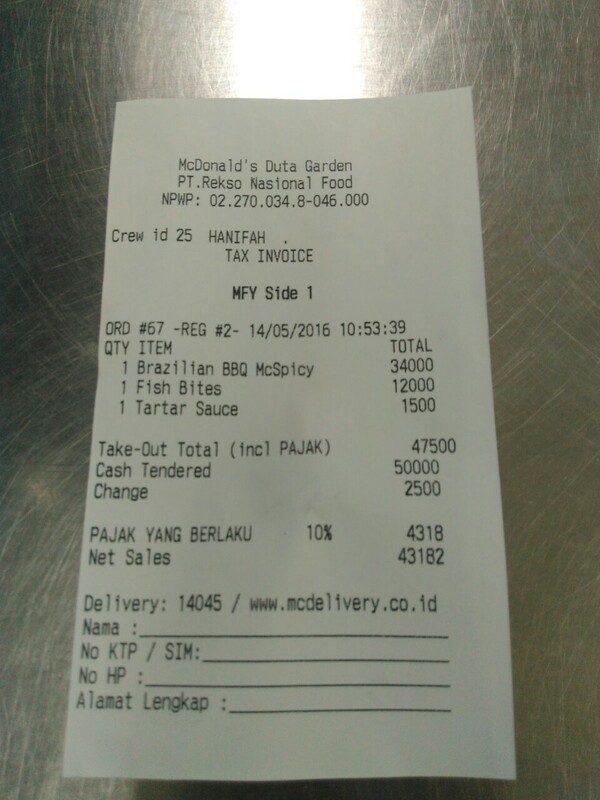 We have cendol sundae cones, chicken foldover, bubur chacha pies, and longan mcflurry.